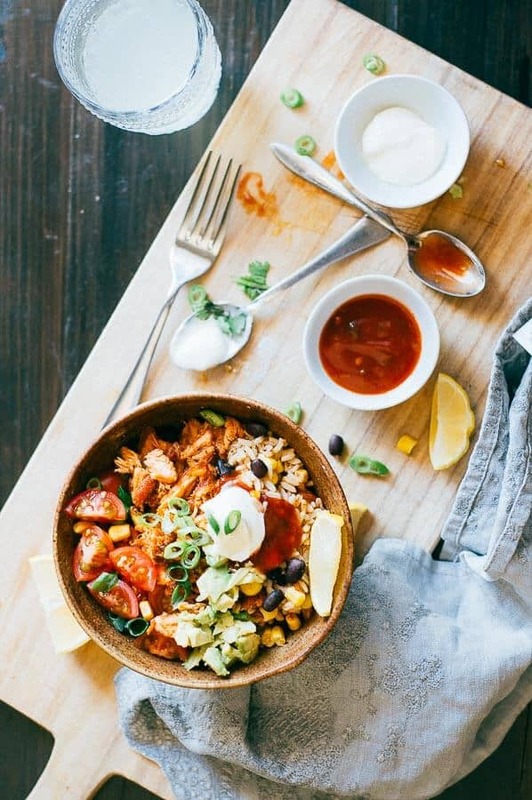 I’ve recently discovered the magic of a Salmon Burrito Bowl and I love it, especially when the fish is crispy and crunchy, saucy and spicy with all the usual Mexican suspects of brown rice, black beans, corn, salsa, tomato, avocado and sour cream. 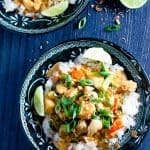 It’s a flavour bomb combination that will wake-up your tastebuds and this dish is mega filling – it left me feeling so full at lunch that I didn’t need any dinner! 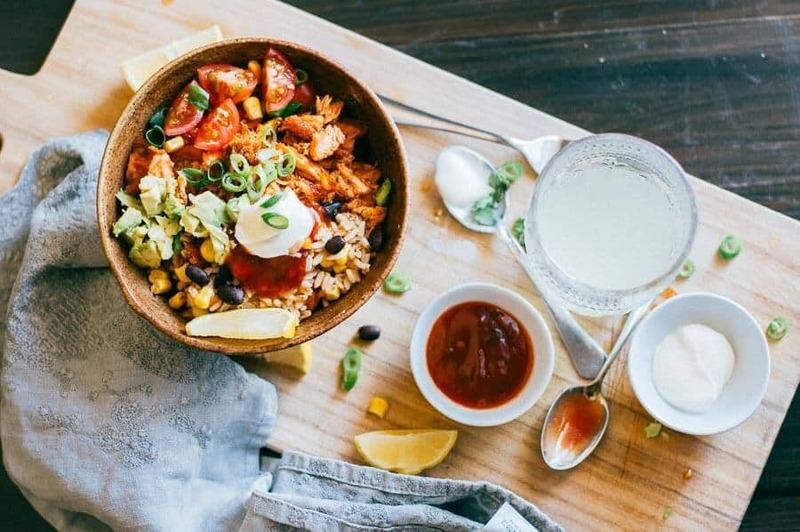 If you’ve only ever had burrito bowls with chicken or beef before, do yourself a favour and try a salmon burrito bowl. Its high in protein and fibre, and low in sugars. 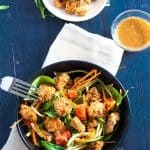 It’s a perfect meal for dinner or lunch under 500 calories and much healthier than buying takeout mexican. Fresh or frozen works. I use skin off Tasmanian salmon that I buy from the seafood counter of my local supermarket. Whilst I generally like to cook salmon with in a day or two of buying it fresh, sometimes this doesn’t happen and I have to freeze it. The good thing is, just a few minutes in the microwave to defrost and its ready to be cooked. TIP: I wouldn’t recommend using canned salmon for this recipe. The dish is at its best when the salmon is crunchy and crispy and I find that it’s easy to achieve this result using fresh/frozen salmon portions. 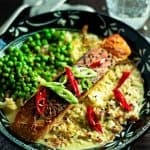 Other Salmon recipes you might like to try: 15 minute Salmon Curry In A Hurry, easy Spicy Salmon Stirfry, or the delicious Chilli Soy Salmon with Sesame Noodles. There’s even salmon on my Seafood Marinara Pizza! 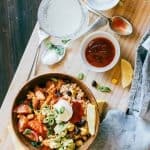 First up, I will say that I like to take a layered approached to putting together my burrito bowl, even though when I sit down to eat it, I usually end up tossing it all together with a fork before eating it. I think layering it into the bowl makes it look prettier, even if it only lasts a few minutes, and makes a good impression on whoever you’re serving it up to. Once crisp and golden on all 4 sides, use the spatula to roughly “chop” into pieces whilst still in the pan and then toss about to heat up the inside flesh. The level of crisp and crunch is up to you, but I like to leave it for a further 3 to 4 minutes to brown off even more. The Salmon burrito bowl is rapidly becoming one of my new favourite bowl foods. It’s simple to prepare and is packed with good omega 3’s and it has all the right textures for a truly indulgent dinner or lunch without leaving you weighed down. Its crispy, crunchy, spicy, creamy, salty and a little bit sweet from the juicy corn. Mmmm, just yum. 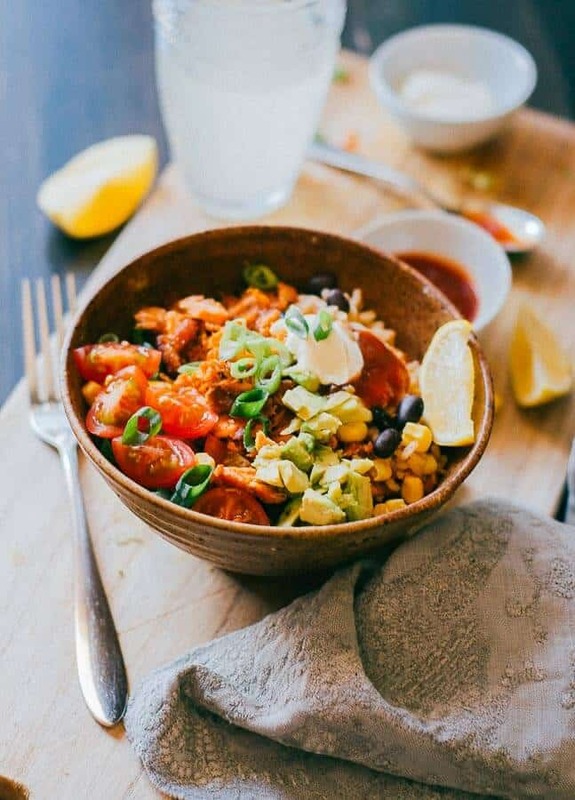 If you’ve tried this salmon burrito bowl or any other recipe on the blog then don’t forget to rate the recipe and let me know how you got on in the comments below, I love hearing from you! 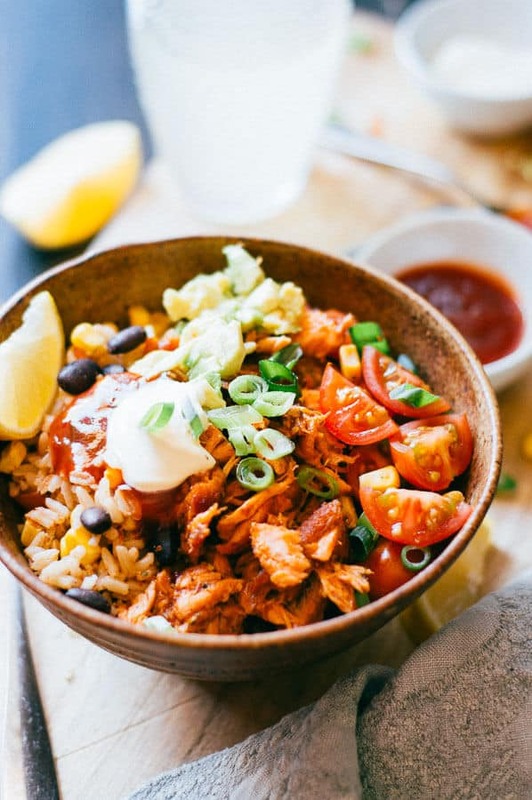 The Salmon Burrito Bowl is a taste sensation with crispy and crunchy salmon, brown rice, blackbeans, sweetcorn, tangy tomato, salsa and smooth silky sour cream. Under 500 Calories, high in protein and fibre it will keep you fuller for longer. Heat a pan to high heat on the stove, then add skinless salmon, flat side down. Cook for 3 to 4 minutes, then turn over and cook for another 3 to 4 minutes. 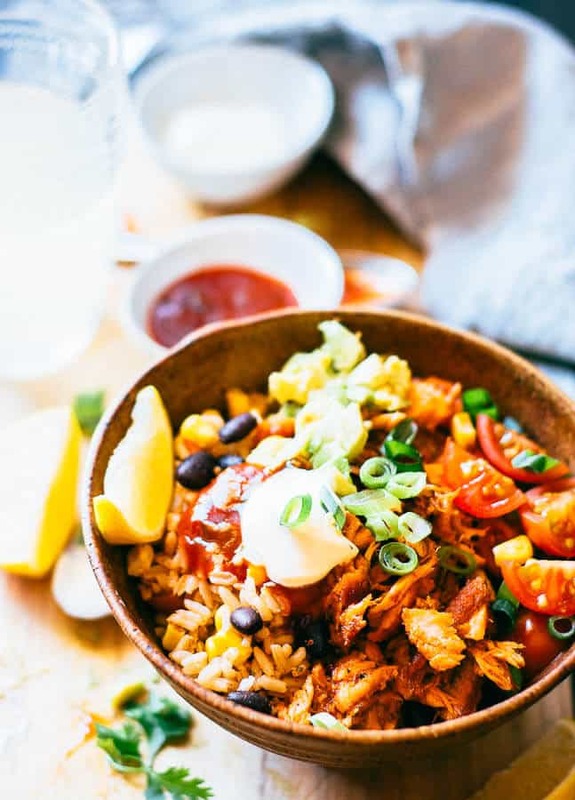 Using tongs, or two forks, shred the salmon in the pan, and add 1 tablespoon of El paso Burrito seasoning with 1 tablespoon of water, keeping the heat on high. Continue to cook salmon for another 5 minutes or so until crispy and golden brown. Then remove from stove. In a mixing bowl, place the cup of cooked rice, corn and blackbeans. Mix to combine. Add the tablespoon of Old El paso Burrito Seasoning and a teaspoon of water. Mix to combine. Of the ¼ cup salsa, take out 1 tablespoon and add to the rice, corn and blackbean mix. Stir to mix it all together. Prepare the bowls: equally divide the rice mix across two bowls. Add the chopped tomatoes and shallot to one side. Add the crispy salmon to the other side. Add the chopped avocado and remaining salsa in the middle and sour cream on top.